alis grave nil: Pink tights equal magic. It's a good running plan, just maybe not for me, for right now. I'm not going to run this week. I don't know when I'm going to run. I feel like such a quitter admitting that, but I spent all last week feeling guilty because I didn't run. I don't like to be miserable. Right now I've made a commitment to ballet, so I need to keep that commitment, even if it means not running. I don't think I can do both, and if I try to do both as I have for the last two weeks, it seems like I'm going to be unhappy and feel like a failure. I'm trying to be careful about my mental and physical limitations. I don't want to end up in a fit of anxiety I can't stop. This seems like the best thing to do. Teaching English full time saps every ounce of energy out of me, and I want to do my best job with teaching ballet... so this is it. I'm not going to worry about it. I'm not going to make myself feel awful when I'm still doing something good for my body and I'm simultaneously doing something good for my family. The extra money is really helping us out, and I'm glad I can help out my former dance teacher. I think this is what I'm meant to do right now. Also, not to be a Debbie Downer, but I started running because I was 150 pounds and I was depressed about my weight. Then I gained 12 pounds. Then I lost 15 pounds, and then subsequently gained three pounds back. I have completely changed my eating and activity habits, and I still weigh 150 pounds. Gah! I think my body just wants to be 150 pounds whether I run or not. But anyway, back to ballet. Monday was the best night I've had so far. I sniffled and coughed my way through the past two weeks, so it was nice just to be healthy this time. More importantly, today I got my plans done early, I took a bunch of Motrin right before I left, and I drank a latte on the way. I'll admit it: I'm a better teacher with a little caffeine in me. It's the same for teaching English. I've been eschewing coffee drinks in favor of lower-calorie tea this year, but I knew I needed a little latte power to get it done tonight. It worked like a charm. I also dressed the part: I wore makeup (shocking! ), a black leotard, pink seamed ballet tights, a black wrap skirt and a black wrap sweater. I wish my hair was long enough to twist into a bun. There's magic in that old uniform. I've been avoiding the ol' pink tights because I feel like a giant pink elephant in them (note: those are SO NOT MY LEGS in that pic), but putting them on helped me remember something: it just feels different to dance in the right clothes. It's easier to see your lines and to move freely and to forget about you and just become ballet. There's a reason for that strict dress code. It makes you feel different. My cutoff sweats haven't been imparting the same je ne sais quoi. 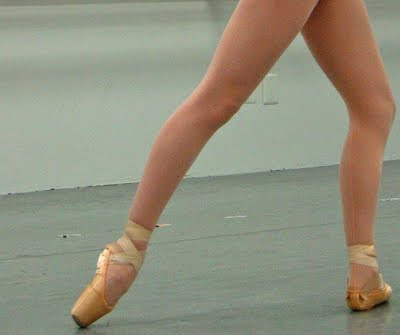 As hard as it is to see my poor turnout and non-dancer legs in those pink tights, it makes me want to use them properly. It's a beautiful thing. It helps that they're seamed tights. Life is better in seamed tights. Trust me. The kids at the studio are great. I finally feel like I'm getting to know them, and it's getting more comfortable to be there. You'd think that as a teacher I'd get used to that awkward phase by now! Nope. Still takes me a long time to learn names, and I still feel really nervous until I know my students--be they English students or ballet students. Man, if people only knew how shy I am. Meeting people (even small ones) is such a challenge. I was initially really worried about not being able to remember everything that I needed to know, but it's coming back to me as I study my old notes and Cecchetti materials. Thank God for the copious explanations in the Manual and for my obsessive note taking back in college. I think I'm going to be okay. The legs in that picture are too skinny anyway. You're making me want to teach again!